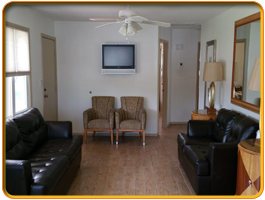 Apartments and Suites are also available for weekly, monthly and seasonal rentals, complete with daily maid service and private patios. Our apartments are limited and seem to be this year’s favorite since summer rentals elsewhere do not include daily maid service, private patios with heated pools as well as private parking, continental breakfast all of the additional amenities of a hotel guests. Families vacationing may choose to consider an Efficiency that would allow for light food preparation. 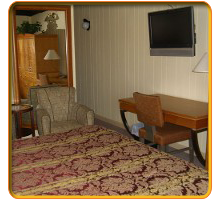 Our Facility offers rooms with optional King Size Accommodations. 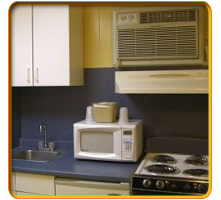 All rooms have small refrigerators and microwaves at no extra charge. Newly Decorated Well Appointed Queen Rooms. 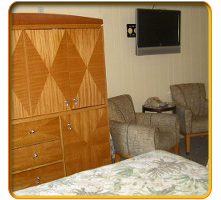 Our Facility offers rooms with optional King Size Accommodations, and for your convenience and comfort, all rooms have small refrigerators. All rooms have microwaves at no extra charge. For Families vacationing for extended periods you may choose to consider an Efficiency that would allow for light cooking. Apartments and Suites are also available for weekly, monthly and seasonal rentals, complete with daily maid service and private patios. Our apartments are limited and seem to be this years favorite since there are not many summer rentals which include daily maid service, private patios with heated pools as well as private parking, continental breakfast all of the additional amenities of a hotel guests.